Need more information about booking Home 7330663 ? 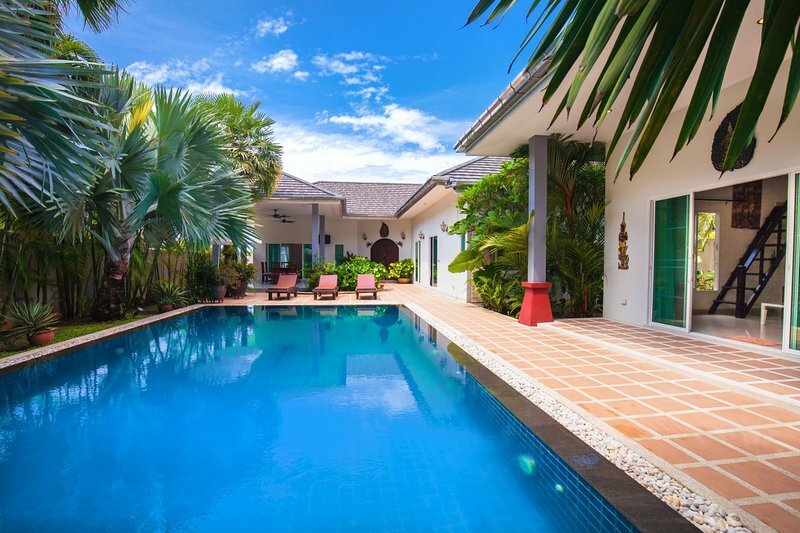 Luxury Villa Shanti is very spacious, luxurious and without any opposite, completely private for 6 people. It has 2 bedrooms with dressing room and work area, two modern bathrooms with spa bath and walk-in shower, a very large open kitchen with granite fully equipped (oven, hob, toaster, microwave, American refrigerator, water fountain ...) center island and bar, a large living room (large screen TV, home cinema, TV, dVD player). The Villa has a fully detached bungalow with pool access, fully equipped with a kitchen, a living room and a mezzanine bedroom. individually controlled air conditioning and ventilation for each room. A large covered terrace where you can lunch in the shelter of the sun terrace with loungers and garden furniture. A very large swimming pool. Built on a 800m2 land with trees and flowers with a fish pond, completely safe and without any opposite.